Posted June 26, 2015 by Heather Michet & filed under Food, Recipes. Summertime…and the pickin’ is easy. The raspberries are luscious, abundant and nearly jumping off their canes into your hand, or mouth if you place your head just right. Berries and chocolate were made for each other and in this recipe, they team up for a delightfully fresh and easy dessert or treat. 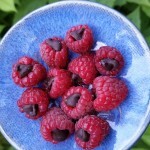 Gather your fresh raspberries and some dark chocolate chips. In each firm berry’s cavity, poke a chip. Arrange on a plate in a single layer and voila! you’ve got dessert. These are fabulous with a hot cup of coffee or a chilled latte.